NO-FTTQ - STEPHEN - Cross Moline (Watford) type. Lewes mint. STEPHEN - Cross Moline (Watford) type, ca.1136-45AD. Lewes mint. Crowned bust right, holding sceptre / +OSB (ERN.ON.L) EPE, cross moline with lis in quarters. 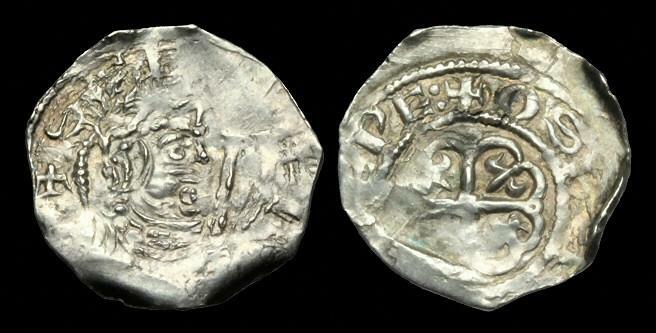 NO-UDQB - HENRY I - Annulets Type Penny, ca.1100AD, ca.19mm, ca.1.0g. NO-DJTF - HENRY I - Profile/X-Fleury Type Penny, ca.1102AD. EXTREMELY RARE. New type for moneyer.